Has everyone marvelled at Andi’s Marilyn and Groucho on IG? 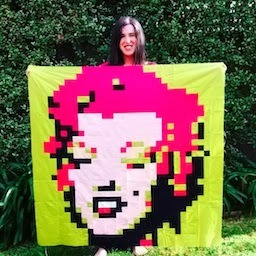 Well I have an am very excited to announce that Andi has ventured into the world of pixilated quilts by offering you the service of making your images into a pixelated quilt pattern. Visit here to experience the 5 easy steps to Awesomeness. The pattern includes cutting and yardage instructions. While the service is under construction, Andi is offering the Marilyn pattern as a free gift when you sign up for the newsletter.